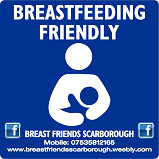 We have started a campaign to discover which venues in Scarborough, and its surrounding areas, welcome and support breastfeeding women. Under UK law passed in 2010, in a section of the sexual discrimination act, mothers can legally breastfeed in public. Breast Friends want to highlight areas where women are made to feel welcome, encouraged and supported in their choice to breastfeed in order to ensure women enjoy their breastfeeding experience. Companies can be issued with a "breastfeeding friendly" sticker to display so women can easily see places where they will be supported in their choice to breastfeed. ​Hopefully 2016 should see Scarborough become the UK's first breastfeeding friendly resort. - Where possible, offer to take food and drink orders over to breastfeeding mums so they don't have to interrupt their baby's feed. Breastfeeding mums say what they appreciate most is a welcoming atmosphere and friendly, attentive staff: something you can provide for free! You can also do little things such as re-arrange furniture, plants or a screen to provide a little privacy. - Display the breastfeeding friendly stickers in a prominent position, so families can recognise your venue as being part of the scheme.